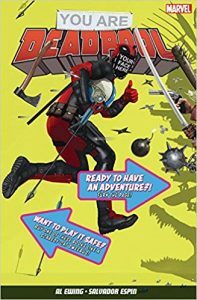 How do you make Deadpool even better than he already is? I have no idea how you’d do it for most folks, but for a life-long Dungeons and Dragons and TSR fanatic like myself, the best way to do it is by throwing in a little RPG (that’s role playing games for those of you not versed in the ways of the icosahedron die) magic; and that’s exactly what Al Ewing has gone and done with You Are Deadpool. It’s been thirty five years, man and boy, since I played my first game of D&D and thirty four since I first ventured into the realm of Fighting Fantasy with Steve Jackson and Ian Livngstone’s The Warlock of Firetop Mountain, a choose your adventure book in which the reader was the hero and through a succession of choices and successful, or unsuccessful, dice roles plotted the course of their own fantastical adventure. 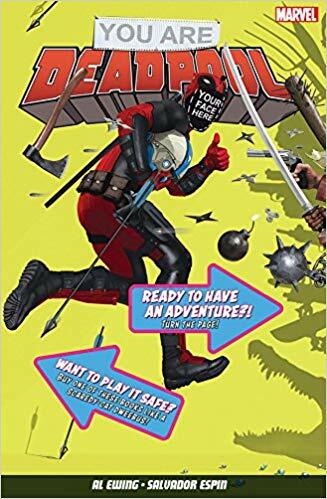 And I’m guessing that Al Ewing’s life has followed a similar, but far more lucrative and prosperous, path to my own, as You Are Deadpool is based on the gaming system which Livingstone and Jackson utilised for their books and by doing so, became gaming icons.